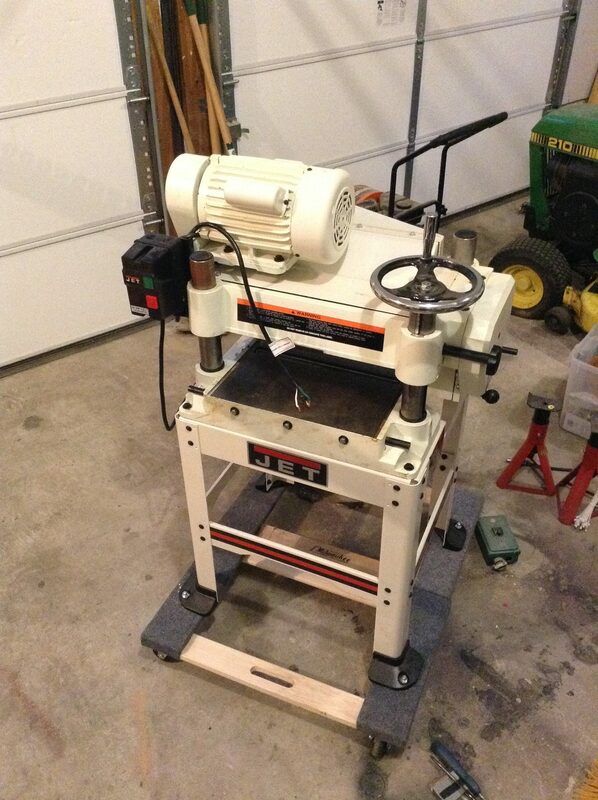 Well, the time has finally come to break down and buy a planer for the shop. In the process of working with rough-cut lumber, a planer is a vital tool. The planer takes the thickness of the boards down to a finish size, and gives a clean smooth finish. This allows me to use thicker rough cut lumber at a much less expensive cost. Though the processing of the wood takes more time, the cost savings over buying ‘by the foot’ milled lumber at Home Depot is tremendous. After deciding to bite the bullet and plunk down over $500 for one of these machines I then had to choose a machine. Though I wanted a large industrial machine, the price tag, tremendous physical size and power requirements made them far outside of my needs. I did lots of research on portable ‘bench top’ planers. Many websites have in depth reviews on many models, and compare power, size, finish quality, and a whole slew of new terms that I was unfamiliar with such as ‘snipe’. FYI, snipe is the over-cutting of the beginning and ends of the board due to uneven pressure holding the board in the machine. Who knew? Despite finding the ‘perfect’ machine for my shop I waited. I searched more. I turned to Craigslist even. Not many options out there, these machines are quite highly desired, and hold their value. After a few weeks of on and off looking at the machines I finally ran across the perfect machine! Turns out it was a mid-side between the large industrial machines and their smaller cousins. The Jet JWP-16OS is the perfect balance of size and Horse Power (3HP!) for my needs. With a with of 16″, I can plane most any material I could possibly need. Though the machine requires 220V, I already have the outlet in the shop for my table saw, so it was a no-brainer! After talking to a friend with a truck and renting a U-Haul trailer we were off for an hour ride to Rockville, MD to load up this beast. Reading the manual it boasted a weight of over 400Lb! We came prepared with all manner of moving equipment, but it turned out that the machine wasn’t nearly that heavy, and quite manageable with 3 guys. After it was loaded up and made the venture back to the workshop I was excited to get it up and running. After wiping it down (and cutting my finger pretty badly!!) and wiring a new plug on the cord it was the moment of truth. With a push of the button the machine was up and running as if it just came out of the crate from the factory! Despite being nearly 8 years old according to the previous owner, it looked like it hadn’t seen much use, if any. I grabbed the nearest piece of maple I could find and ran it through the machine. The board came out incredibly clean and flat! Definitely a happy moment given how much the machine cost, even used. It will probably take a bit of time to really tune it up, but this new workhorse will give a long life in its new duty processing all manner of wood for the engraving shop. Certainly happy I found it used as well, getting a virtually new machine for less than half the cost of a new one is certainly a happy moment!